Athletes competing at the Helsinki Olympic Stadium where the first and tenth editions of the Championships were staged. 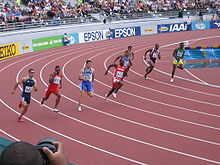 The World Championships in Athletics is a biennial event which began in 1983. Organised by the International Association of Athletics Federations (IAAF), the World Championships are a competition comprising track and field athletics events available to male and female athletes from any of the IAAF's 213 member federations. 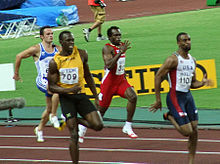 Championship records are set when an athlete achieves the best mark in an event at one of the editions of the Championships. World, area, and national records have been set at the championships over the course of its history. Competitors at the World Championships come from around the globe and records have been broken by athletes from all six continents. The United States has been the most successful competitor at the World Championships in both medals and records. Four athletes hold multiple records: Marion Jones holds both the individual and relay record in the 100 metres, Michael Johnson holds individual and relay records in the 400 metres, Jackie Joyner-Kersee broke both the heptathlon and long jump records in 1987, and Jarmila Kratochvílová set the records in the 400 and 800 metres at the inaugural Championships in 1983. Kratochílová's records have gone unbeaten for over 30 years and are the two oldest records of the Championships. Colin Jackson broke the 110 metre hurdles world record in 1993; a record which stood for over a decade. Mike Powell's world record long jump at the 1991 Championships has never been bettered. Double record holder Michael Johnson held the 400 metres world record with his run in Seville for almost 17 years. Tirunesh Dibaba was only 20 when she won two gold medals and set the 5000 metres record. Yelena Isinbayeva broke the pole vault world record for the thirteenth time in 2005. Paula Radcliffe had won only one medal in five Championship appearances before she broke the Marathon record in Helsinki. Official record tables. IAAF. Retrieved on 2009-06-17. Competition websites. IAAF. Retrieved on 2009-05-09. ^ "Marathon Results" (PDF). IAAF. 2009-08-22. Archived from the original (PDF) on 2012-04-07. Retrieved 2009-08-22. ^ "High Jump Result - 14th IAAF World Championships". IAAF. 15 August 2013. Retrieved 15 August 2013. ^ "Men's Decathlon Results" (PDF). IAAF. 29 August 2015. Retrieved 29 August 2015. ^ "50km Race Walk Results" (PDF). IAAF. 13 August 2017. Retrieved 13 August 2017. ^ "4x100 Metres Results" (PDF). IAAF. 4 September 2011. Archived from the original (PDF) on 27 May 2012. Retrieved 4 September 2011. ^ Results – 4 X 400 METRES – Men – Final Archived 2009-06-26 at the Wayback Machine. IAAF (1993-08-22). Retrieved on 2009-05-08. ^ Official Results - 100 METRES - Women - Final Archived 2012-08-15 at the Wayback Machine. IAAF. Retrieved on 2013-07-07. ^ "200m Results". IAAF. 28 August 2015. Retrieved 28 August 2015. ^ "Women's 5000m Results". IAAF. 30 August 2015. Retrieved 30 August 2015. ^ "400 Metres Hurdles Results" (PDF). IAAF. 2009-08-20. Archived from the original (PDF) on 2012-04-07. Retrieved 2009-08-21. ^ Peters, Samuel (2005-08-12). 5.01m Pole Vault WORLD RECORD – Guess who?. IAAF. Retrieved on 2009-05-08. ^ "Hammer Throw Results". IAAF. 27 August 2015. Archived from the original on 2015-09-24. Retrieved 27 August 2015. ^ "Javelin Throw Results" (PDF). IAAF. 2 September 2011. Archived from the original (PDF) on 2 December 2011. Retrieved 2 September 2011. ^ "10 km Race Walk Results". IAAF. 1995-08-07. Archived from the original on 2010-08-08. Retrieved 2011-05-18. ^ Results – 4 X 400 METRES – Women – Final Archived 2009-06-26 at the Wayback Machine. IAAF (1997-08-22). Retrieved on 2009-05-08. ^ "Heptathlon – High Jump Results" (PDF). IAAF. 5 August 2017. Retrieved 5 August 2017. ^ "Heptathlon – Javelin Throw Results" (PDF). IAAF. 6 August 2017. Retrieved 6 August 2017. This page was last edited on 31 January 2019, at 22:41 (UTC).